When designing web pages its a good idea to remember the principal that too many items on a page may make it difficult for customers to reach a decision or find information. Keep it simple! Your goal, after all, is to meet a need of a customer or prospect. Make sure the user of your web page can find the central purpose without having to look through alot of junk. If the main purpose is to share information, then make that information prevalent in the center of the page. If your main purpose is to buy something, then make sure the product or service description is in the center of the page and the buttons to get to the next step are clearly marked. I know, this sounds so elementary and common sense. But we tend to complicate things when we try to cram alot of extra stuff on a page. Remember, it’s all about the customer. It’s not about you! Let’s take a look at few examples of this principal in action. Here are some practical steps and examples creating more focused web pages for your customers. Emphasize those items critical to your purpose in the areas of the site that are most commonly scanned by customers. This would be on the left side of the page and across the top. Chances are you using a left-to-right language. So don’t put your most important messages or directives on the right side of the page. Look at this page from Scottrade. What is really the main purpose of this page? 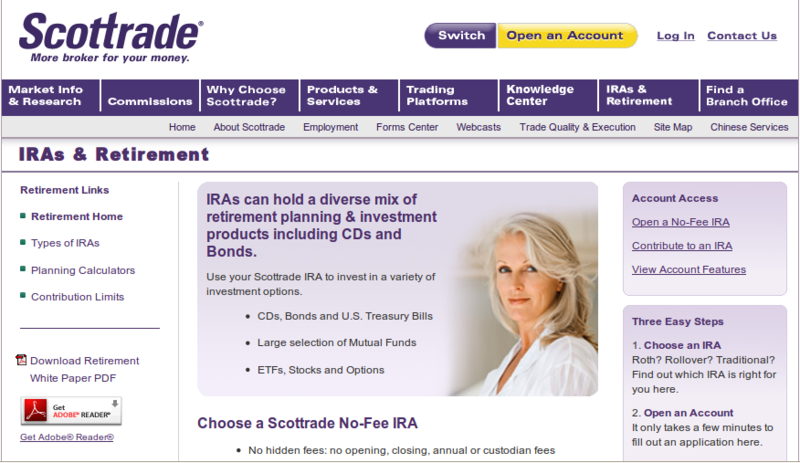 There are informational links about retirement plans on the left. There is a nice picture with some information in the middle. Then on the right side of the page there are links to opening an account. I can’t tell if the main purpose here is to give me information about retirement accounts or to provide a place for me to open the account. 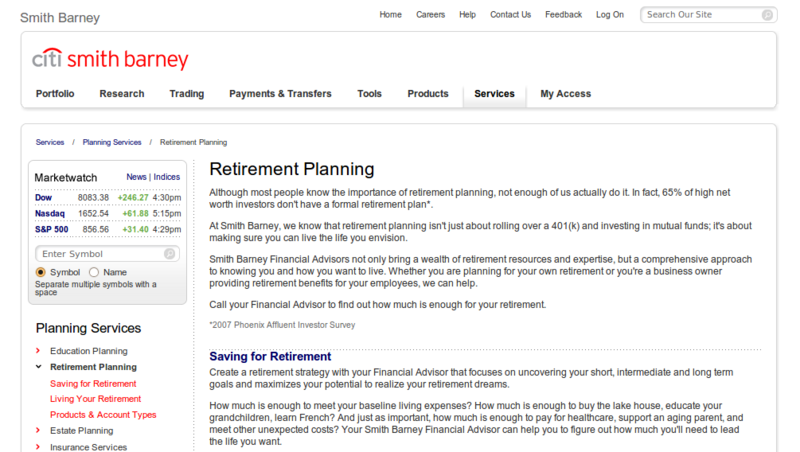 Contrast that with the following retirement page on the Smith Barney web site. The Smith Barney page does not make use of the right side navigation area. So the customer can focus more on the content in the center of the page. This page is focused on providing the user with information about a planning service offered by Smith Barney. Move secondary elements that don’t support your primary page purpose to the footer or right navigation pane. This could be things such as investor relations, about us, mission statement, and management bios. 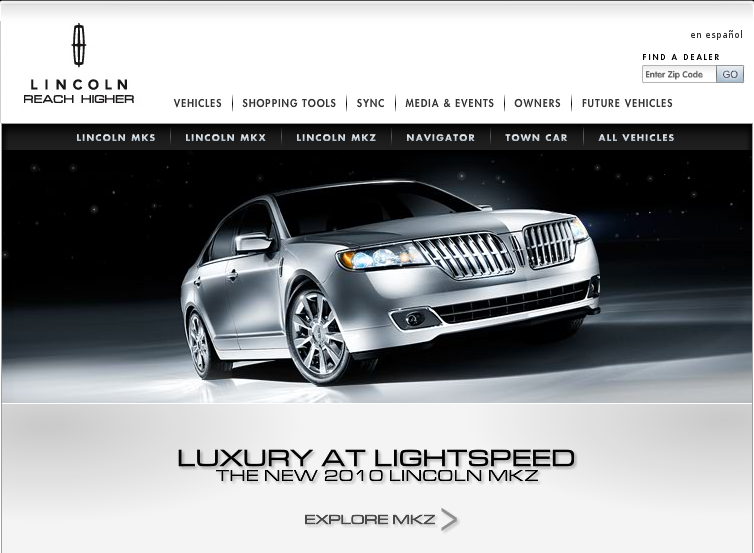 Take a look at this start page for Lincoln. Is there any doubt what the main purpose is? They want to get you into a car by giving you information and the ability to customize the car online. Where are all the corporate links? At the bottom of the page below the screen fold in my case and off my screen shot. So maintain customer focus in your Internet Marketing efforts by keeping web page layouts simple. Conversions will be easier to track, customers will more likely find what they need, and your site site will be easier to maintain.